In life there are times when something huge happens whilst I am somewhere else. I might feel a chilly hand on my neck, or the sensation of it, without having a clue why. Later, sometimes much later, I might discover that, at just that time, this huge something was going on with a loved one. Last Friday I caught the noontide train down to Glasgow. I was supposed to be visiting a girlfriend but she called in sick and, as I was packed and arranged-up, I decided to go and see my sister instead. The train was overly packed with not enough seats for all, or, only just, and only just is no fun when half the inmates bear heavy loads they cannot lift onto the overhead racks. Nobody can. In fact, as they ease off the shoulder straps and shrug a massive rucksack into the gravitational pull, I am amazed it doesn’t go right through the carriage floor. And that was just one of the many. The rest of us with less baggage, clasp it to ourselves on our narrow seats and decide to wait until the stock rolls before flicking our eyes around for a more acceptable resting place. This is when a furry-voiced announcement slinks out from the speakers. Something about a bus being laid on for those who can’t fit on board. We look at each other eyes rolling. Way too late, they say. Way too late and, besides, we are now all fankled up in rucksack webbing, too many legs, big shoes and well-fed travellers to move anything other than our eyeballs. It crosses my mind to suggest that the man who sold us all those tickets a few moments ago might consider counting them up next time, a fairly logical plan and one that might decide the bus option before we struggle aboard and meld into one living creature. We are all hot now and a bit grumpy and those lads just up ahead have obviously been on the sauce for a while now, their voices cutting sharply into the mumbled air. The weekend was lovely and the journey home a very different kettle of fish. We all had room, we travellers with less baggage, dotting ourselves throughout the train, pulling open our ziplock lunches, to munch contentedly, elbows out. I thought everything was calm in my world, because, as far as I was concerned, it was. But, there was a chill at my neck, like cold fingers and yet all the windows were closed. I pulled out a cardigan and wrapped it round me, but the chill remained. Back home, a huge drama was beginning to unfold, the facts of which I now have, and will tell, as best an absentee can, through the eyes and experience of my old China. The boat had landed the passengers back on the pontoon and Popz had taken Poppy up to the grass for a pee, as usual, returning to the boat to clean up and take her back to her mooring, way out in the bay. It’s about 500 yards. Once the mooring line was secured, the crew and skipper set to cleaning and tidying, turning off electrics and engines and checking the heads for all those forbidden things people think can disappear down a tiny pipe. This cleaning process can take a while. 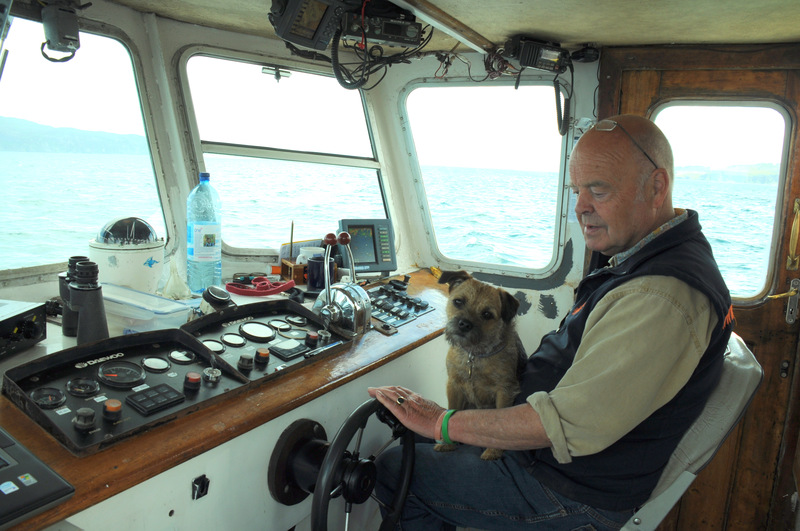 Popz was aware Poppy wasn’t with him, but, then, she often joined the crew whilst they worked, so he wasn’t concerned as they all clambered into the dingy. They presumed she had jumped back off the boat at the pontoon and that they would find her, as before, sitting waiting for their return. No sign. Concern is now rising. They asked everyone, looked everywhere, called and whistled. Perhaps someone had taken her? They turned again for Sula Bheag, crossing, once more, the distance through the waves. Searched everywhere, above, below, inside and out. Nothing. Back to the shore. Time is passing now. Up the street, into the town, asking everyone, Have you seen a little brown dog? At the harbour, some kind people with boats cast them off and set to, searching the expanse of water for this little brown dog. Once more Popz and the crew returned to Sula Bheag, although by now hope was dwindling. No human being could survive this long in the icy water and it was obvious she must have slipped overboard. Then, as they fired up the outboard to return for the last time to the shore, Popz noticed some gulls circling, looking like they were looking down at something, way out in the bay. And they were. Upside down, four legs above the surface, plus her nose, but barely, was Poppy, all but given up the fight. As Popz grabbed her, the flea collar snapped and she began to sink. In desperation, he lunged for her, and caught her before she became part of the darkness. She was almost dead, her breathing just now and again, frothing salty bubbles from her mouth, but, nevertheless, alive. A crew member drove like the wind down to the vet, with Popz cradling a defeated Poppy on his lap, wrapping her round to bring back some warmth. The vet held out little hope. Salt damage to lungs and kidneys, shock, cold, hypothermia, the oil and muck in the harbour, all threatened to take her out, and he decided to keep her overnight to monitor her progress. The next morning we phoned, and he said he couldn’t believe the change. Sitting up, weakened but alive, our little girl had decided not to die. Although we had to wait a couple of days to be sure the salt hadn’t destroyed her inner workings, we can now say she is a miracle. Thinner, yes, and not eating much yet, but bouncy and bright-eyed and we are filled with thanks, to the crew and their hearts, to those who took their boats out, to the callers and well-wishers, to the vets. She may have gone overboard, and you may think ‘careless’ but life happens whilst we make other plans and we can all remember times we didn’t pay enough attention. But, now here’s the thing. If the old seadog didn’t have the instinct that he does have, then those gulls might have got their lunch after all. This entry was posted in Island Blog and tagged alive, Boat, bouncy, brave, breathing, bright-eyed, callers, Cleaning, cradled, crew, dead, distance, engine, fired-up, gulls, heads, Heart, hope, hypothermia, little brown dog, looking, lungs, overboard, Poppy, Popz, progress, salt damage, sea dog, shock, sink, Warmth, waves, weak, well-wishers. Bookmark the permalink.